Here is the mother of all Crates! You spoke – We listened. Now customize however you’d like. 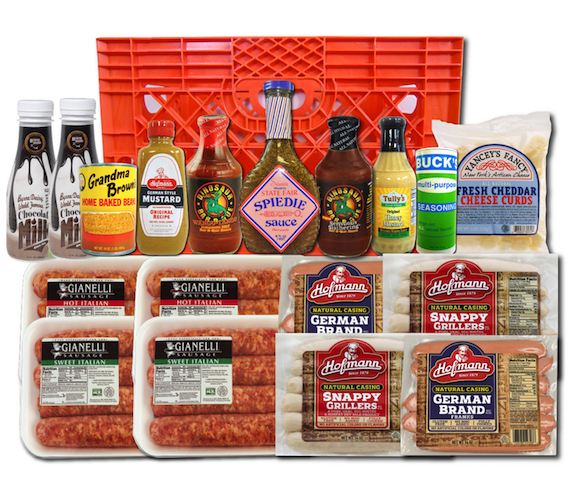 Choose any 6 amazing cold items including Hofmann Hot Dogs, Gianelli Sausage, Yancey’s Fancy Cheese Curds or even that World Famous Byrne Dairy Chocolate Milk. Then choose from a select group of 5 sides from brands like Dinosaur BBQ, Tully’s, Grandma Brown, State Fair Spiedie Sauce or Buck’s!!! You cannot go wrong with this package! Perfect for any tailgate, cookout or special event! CHOOSE SIX (6) COLD ITEMS AND FIVE (5) SIDES!! !